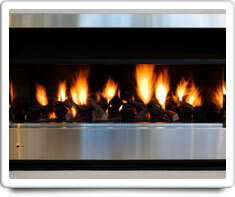 A Gas Fireplace is a fireplace that burns either natural gas or propane to create flames and heat. There are three main types of gas Fireplaces: 'gas fireplace inserts' that are installed in the opening of an existing wood burning fireplace and are vented through the existing chimney with a special vent pipe that carries the exhaust to the outside; 'direct vent gas fireplaces' which can be vented directly through an exterior wall and do not require a traditional masonry chimney; and 'vent-free gas fireplaces' that are designed to operate without the venting of exhaust fumes to the outside. A pilot light operates continually to ensure piped in gas burns whenever it is present. CO Detectors, Fireplace (wood-burning) and Wood Stove. Shown in the 'Routine Care' section are the recommended routine maintenance tasks for your fireplace (gas). The 'Q & A' section shows answers to common questions. And the 'Articles' section provides helpful articles about your fireplace (gas).